The purpose of this investigation was to compare the efficacy of colistin-based therapies in extremely drug-resistant Acinetobacter spp. bloodstream infections (XDR-ABSI). A retrospective study was conducted in 27 tertiary-care centers from January 2009 to August 2012. The primary end-point was 14-day survival, and the secondary end-points were clinical and microbiological outcomes. Thirty-six and 214 patients [102 (47.7 %): colistin–carbapenem (CC), 69 (32.2 %): colistin–sulbactam (CS), and 43 (20.1 %: tigecycline): colistin with other agent (CO)] received colistin monotherapy and colistin-based combinations, respectively. Rates of complete response/cure and 14-day survival were relatively higher, and microbiological eradication was significantly higher in the combination group. Also, the in-hospital mortality rate was significantly lower in the combination group. No significant difference was found in the clinical (p = 0.97) and microbiological (p = 0.92) outcomes and 14-day survival rates (p = 0.79) between the three combination groups. Neither the timing of initial effective treatment nor the presence of any concomitant infection was significant between the three groups (p > 0.05) and also for 14-day survival (p > 0.05). Higher Pitt bacteremia score (PBS), Acute Physiology and Chronic Health Evaluation II (APACHE II) score, Charlson comorbidity index (CCI), and prolonged hospital and intensive care unit (ICU) stay before XDR-ABSI were significant risk factors for 14-day mortality (p = 0.02, p = 0.0001, p = 0.0001, p = 0.02, and p = 0.01, respectively). In the multivariable analysis, PBS, age, and duration of ICU stay were independent risk factors for 14-day mortality (p < 0.0001, p < 0.0001, and p = 0.001, respectively). Colistin-based combination therapy resulted in significantly higher microbiological eradication rates, relatively higher cure and 14-day survival rates, and lower in-hospital mortality compared to colistin monotherapy. CC, CS, and CO combinations for XDR-ABSI did not reveal significant differences with respect to 14-day survival and clinical or microbiological outcome before and after propensity score matching (PSM). PBS, age, and length of ICU stay were independent risk factors for 14-day mortality. 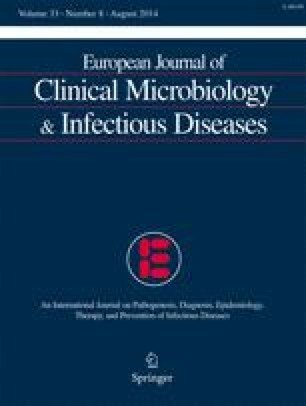 This study was presented orally at the 23rd European Congress of Clinical Microbiology and Infectious Disease (ECCMID), 30th April 2013, Berlin, Germany.